For some reason, Madhouse Munchies have gotten rid of a well designed bag and replaced it with an inferior one! There is both a lot going on with this new design and not much going on with this new design! The contradiction is with the excellent bold color coding for the flavors. The flavor also shouts loudly. The logo is great. However, the logo is also a bit overly detailed and in the wrong position (it should be at the top as it was before), and there's lots of writing about. Firstly, I should say, after munching through a bag of these I was allowed to walk outside and along the street without my family saying a word about the large green fleck of seasoning I had between my teeth (I saw it in a store mirror). The crunch was very good. It ranged from crispy to rigid and firm munching. These Chips were just about the right thickness to handle Kettle Cooking. They were thick enough to withstand a good crunch and thin enough to provide some delightful shapes and curly Chips. There were some larger oil bubbles mixed in with the small bubbles. The highlight however, has to be the seasoning. There was not a coating as seasoning often provides, but instead these Chips looked like they had a disease! There were brilliant flecks of all sorts of shapes, sizes and colors - good stuff. A Nose Plunge Test revealed an instant hit of onion, which augured well. We should add, this was a very well titled flavor. 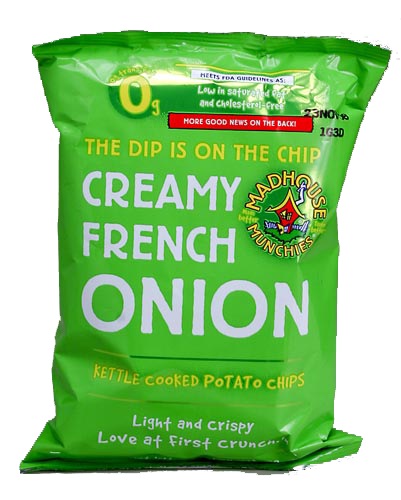 Many Sour Cream & Onion Chips have an imbalance towards one or other flavor. This was called Creamy French Onion and that is exactly what it was. It tasted a little like the Chip had been dunked in dip.